This is taken from a tv broadcast so there are a couple of on screen messages for upcoming films. Can't do anything about it though! 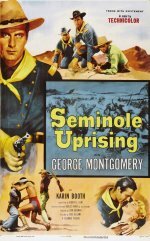 Cavalry lieutenant Cam Elliott is ordered to bring in Seminole chief Black Cat, who is leading his people in a campaign of terror and bloodshed. The tribal leader then kidnaps the girl Elliot loves and plans to trade her for more weapons from renegades. Western, starring George Montgomery, Steven Ritch and Karin Booth.